For years I’ve been buying what Brad and I refer to as “oven fish” from Whole Foods or Fresh Market. 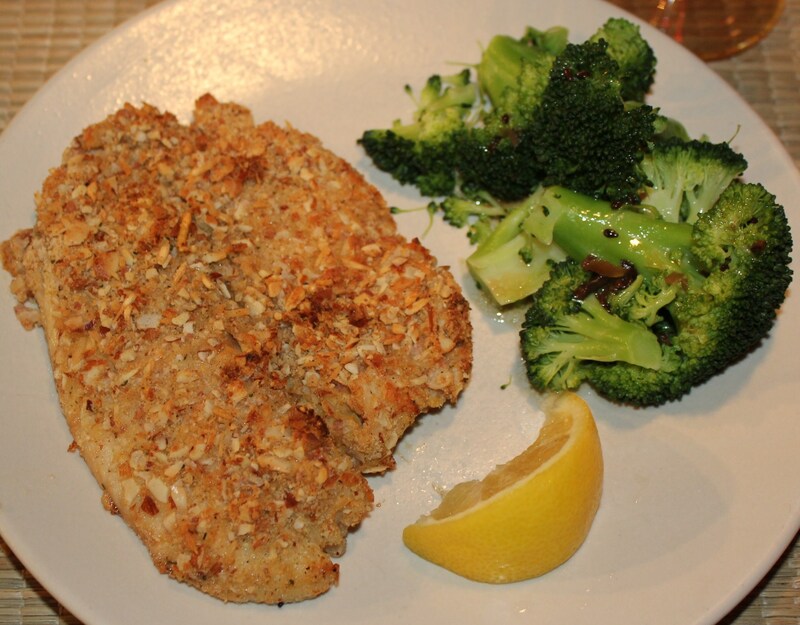 “Oven fish” is simply fish filets such as tilapia, trout or flounder, encrusted in some sort of bread crumb mixture that may include Parmesan cheese and/or nuts such as pecans, pistachios or almonds. Simply bake for 20 minutes or so, and voilà, you have an easy and delicious main dish to serve for dinner. But the breaded fish usually comes at a price, as most prepared “fresh” foods do – the other day it was $10.99/lb. So I decided to save some money and make my own encrusted fish. I found some great tilapia filets for $6.99/lb. Sliced almonds were also on sale and became my nut of choice. I’m not 100% sure what the stores use to make the crust stick on the fish, but decided to give mine a bit of a kick with Dijon mustard. Excellent choice! 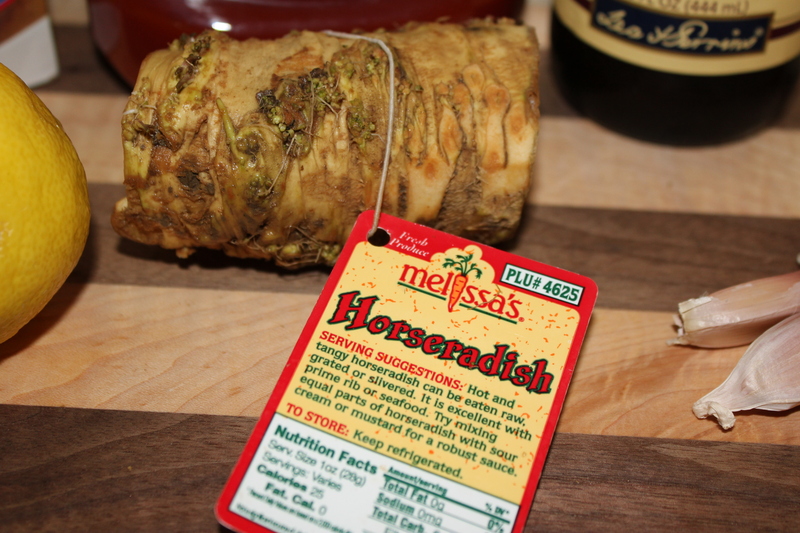 It gave the filets a nice depth of flavor that the store-bought fish does not have. It takes a little bit longer to prepare this fish instead of buying the store-bought, but not by much and what you save makes it all worthwhile! This entry was posted in Pescatarian, Recipes and tagged Almond parmesan encrusted tilapia recipe, Baked fish recipe, baked tialpia recipe, crispy oven baked fish, eat drink and be merry, kel's cafe of all things food, Kelley Chisholm recipes, Oven fish tilapia recipe, tilapia recipes on March 29, 2013 by kelscafe. This entry was posted in Pescatarian, Recipes and tagged Almond parmesan encrusted tilapia recipe, Baked fish recipe, baked tialpia recipe, crispy oven baked fish, eat drink and be merry, kel's cafe of all things food, Kelley Chisholm recipes, Oven fish tilapia recipe, tilapia recipes on March 29, 2013 by kelleychisholm. Brad and I love salmon, so when his sister Karen sent me this recipe, I knew I would have to give it a try. Karen lives in the Pacific Northwest and cooks a lot of salmon, and thought Brad and I would like the Asian flavors of this particular dish. 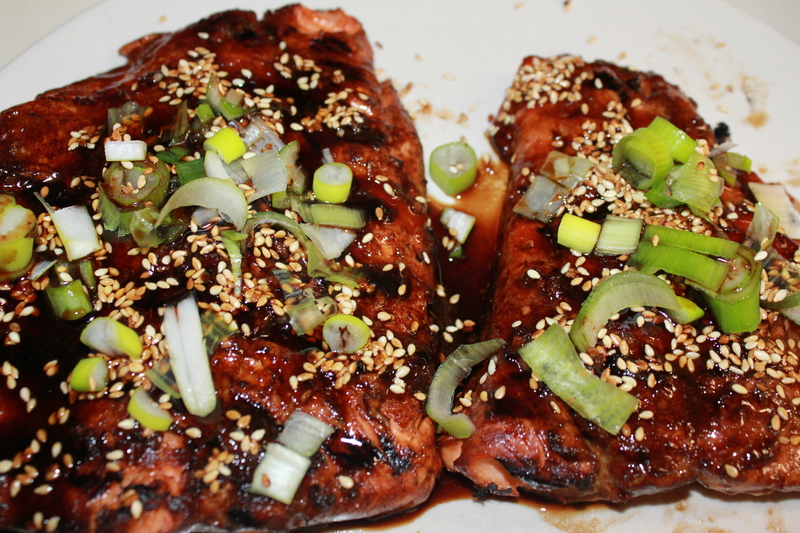 She was right – we loved the mixture of the ginger, soy and sesame, both as components of the marinade and the accompanying Honey Sesame Ginger Glaze. Karen’s recipe (which I’m sure she got off the Internet because I’ve seen several that match hers) calls for broiling this in the oven, but we cooked ours on the grill. I also tweaked some of the ingredients and used less brown sugar and more garlic. I added some fresh lemon juice because I think fish and citrus are meant for each other. I used dark soy sauce instead of regular since that’s all I had on hand. 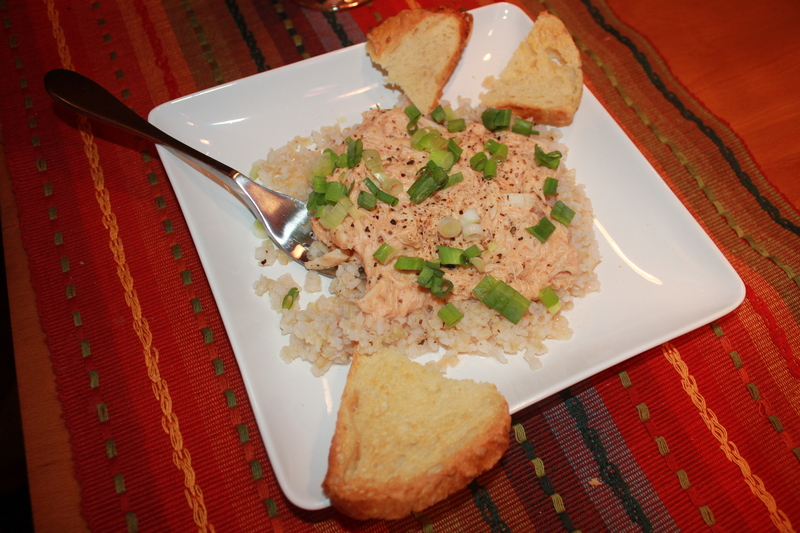 Also, her recipe did not specify the type of salmon, so I used my favorite, sockeye. I’m sure any type of salmon will work well. 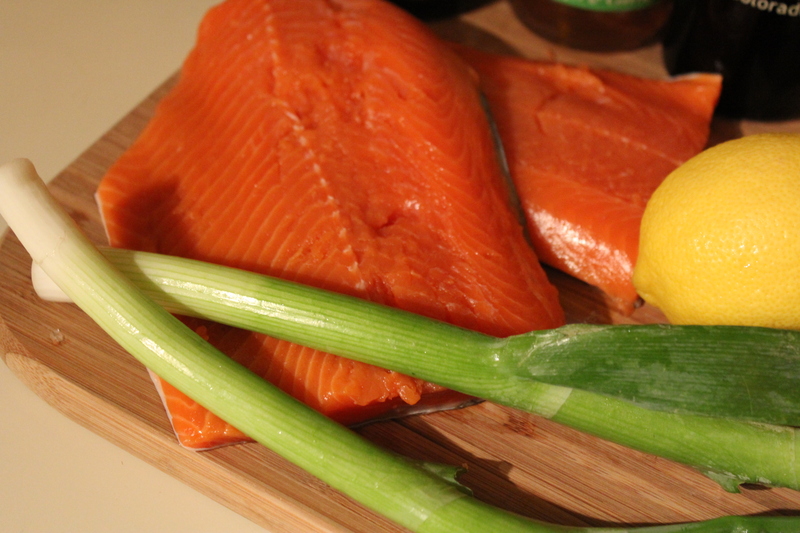 This entry was posted in Pescatarian, Recipes and tagged eat drink and be merry, Grilled salmon, kel's cafe of all things food, pescatarian recipes, Salmon recipes, Sesame Ginger Salmon With Honey Ginger Glaze, sockeye recipes on January 31, 2013 by kelscafe. 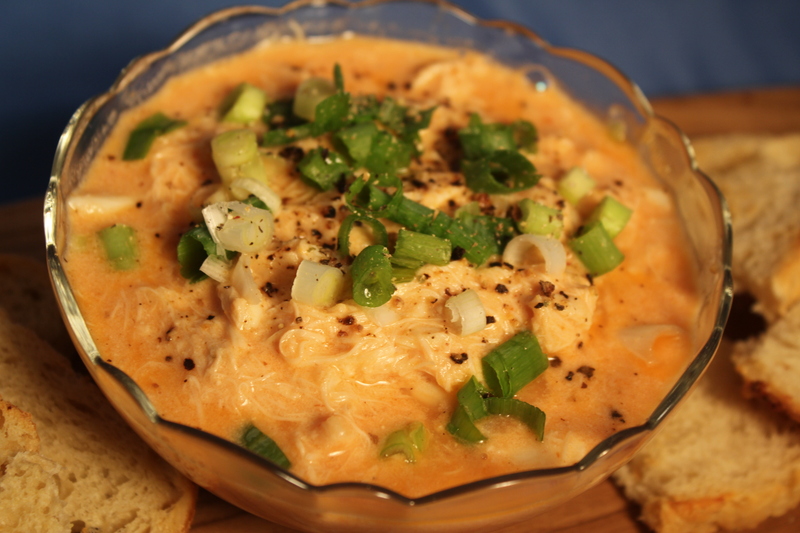 When is the last time you enjoyed a great Crabmeat Newburg? Well, now’s the time to do so if you want to celebrate National Crabmeat Newburg Day, which is Sept. 25th. When I was selecting my food of the month, I wanted to go with something I’ve never made before. The fact that I love crabmeat was also a deciding factor. What I like about this easy recipe is that it works well as an appetizer served with toast or crackers or as a main meal over rice or noodles. It also reminds me of my Dad, who occasionally made a wonderful Seafood Newburg on New Year’s Eve. I think he would approve of my version, but I will probably add some shrimp next time to make mine more like his. This dish is rich, creamy and oh, so, so satisfying. It’s great to serve at a party or potluck dinner since it’s so easy to put together. 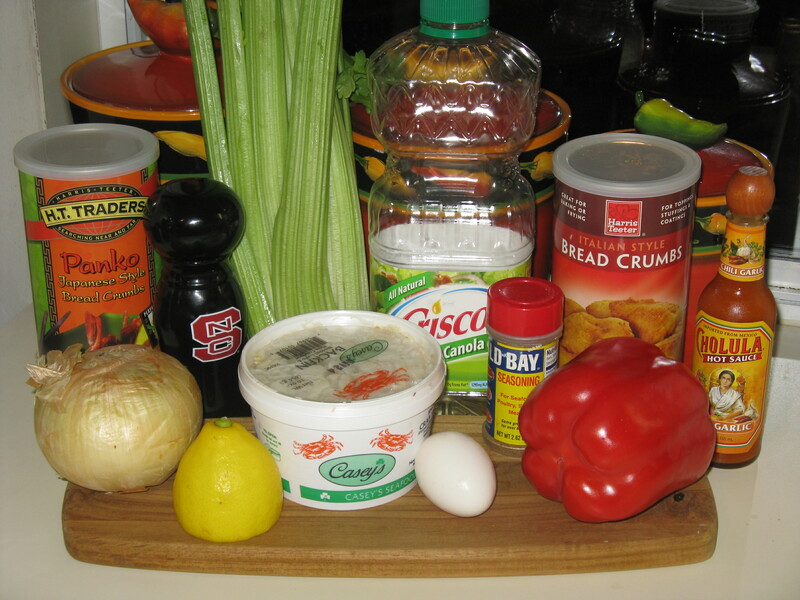 Try to find your crabmeat on sale if possible – this can definitely be a budget-stretcher otherwise, and you may want to save it for special occasions. This entry was posted in Food of the Month, Pescatarian, Recipes and tagged Crabmeat appetizers, Crabmeat Newburg recipe, Crabmeat over rice, Crabmeat with sour cream sherry lemon, eat drink and be merry, kel's cafe of all things food, kel's cafe pescatarian recipes, Kelley Chisholm blog, Kelley Chisholm recipes on September 24, 2012 by kelscafe. Restaurant Review: Mura – Raleigh, N.C.
We recently had an unexpected night away from the kids and decided to go to Mura at the last minute. This is becoming one of my favorite restaurants in Raleigh. 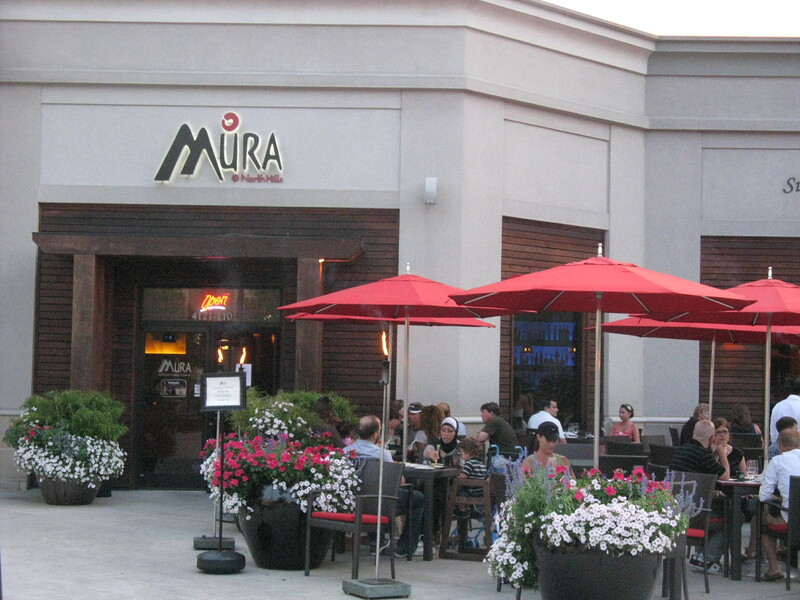 Located in the once again trendy North Hills shopping center off of Six Forks Road, Mura is a beautiful Japanese fusion restaurant, serving Kobe beef, a variety of steaks, seafood, mixed cuisine and the finest grade sushi. It has won a handful of “best-of” awards since opening in 2008. This was my third (or fourth) visit to Mura, and it keeps getting better each time! This entry was posted in Pescatarian, Restaurant Reviews, Vegetarian/Vegan and tagged avocado salads, avocado salads raleigh restaurants, carolina sushi rolls mura, carolina sushi rolls raleigh, crabcakes with tuna, eat drink and be merry, food blog, Japanese restaurants Raleigh NC, Japanese restaurants Raleigh reviews, Kel's cafe, kel's cafe of all things food, Kelley Chisholm blog, mura raleigh n.c. reviews, mura raleigh nc, mura raleigh reviews, mura review, Raleigh food blog, Restaurant reviews, Restaurant Reviews Raleigh NC, tuna crabcake reviews, tuna crabcakes, vegetarian on July 10, 2011 by kelleychisholm. 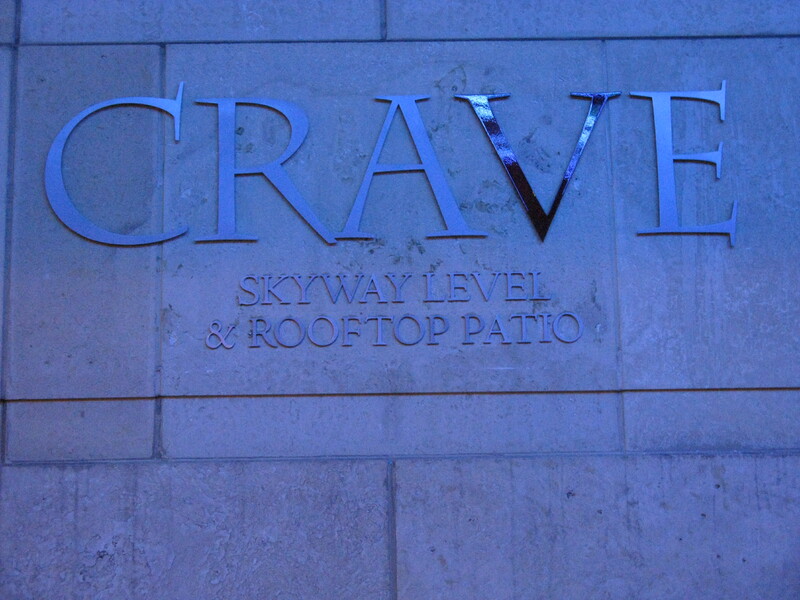 Restaurant Review: Crave – Minneapolis, Minn. I wound out up at Crave after an adjustment to my original plan to go to 112 Eatery to check out Isaac Becker’s cuisine (I recently mentioned him in my Top Tips from Food Network Magazine blog). Luckily, the walk to 112 Eatery from my hotel room was only about 15 minutes. Unluckily, when I arrived there was a flyer on the door that it was closed for kitchen renovations and would reopen the next day. Sigh, major sigh. Especially walking with plantar fasciitis. However, a cool looking place, Crave, was right across the street from my hotel. Thank you, renovation gods, what a great experience I had at Crave! This entry was posted in Pescatarian, Restaurant Reviews and tagged Crave Minneapolis, Crave Minneapolis restaurant review, eat drink and be merry, food blog, Kel's cafe, kel's cafe of all things food, kel's cafe pescatarian recipes, Kelley Chisholm blog, Minneapolis restaurant review, Minneapolis rooftop bars, pescatarian meals, Raleigh food blog, Restaurant reviews on June 12, 2011 by kelleychisholm. 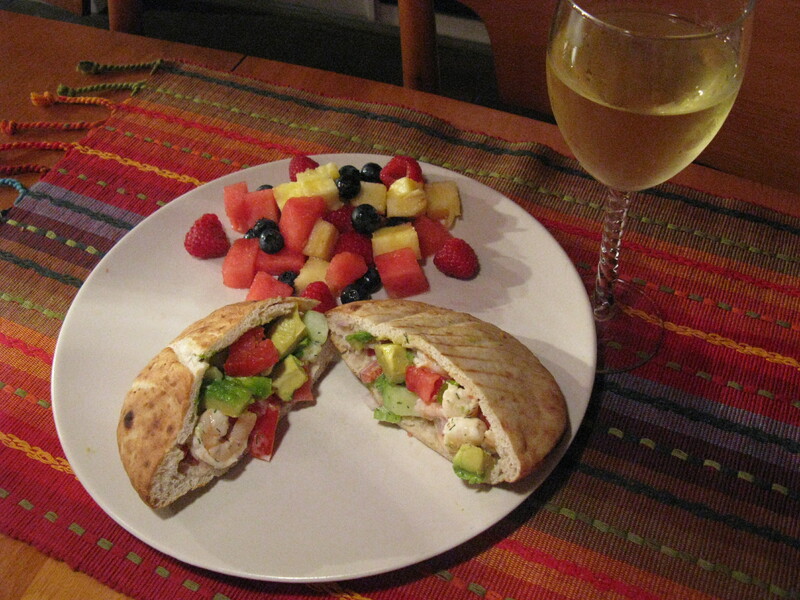 Years ago, Clawson’s Restaurant and Pub in beautiful Beaufort, N.C., served a delicious shrimp salad in a pita pocket. Beaufort is on North Carolina’s crystal coast, right outside of Atlantic Beach and Morehead City, and has a great collection of wonderful restaurants and bars for such a small area. For some insane reason, this dish disappeared from Clawson’s menu quite a while back. However, ever since the first time I had it, I’ve tried to replicate the recipe at home and love my latest low-calorie, low-fat version. I hope you will, too! 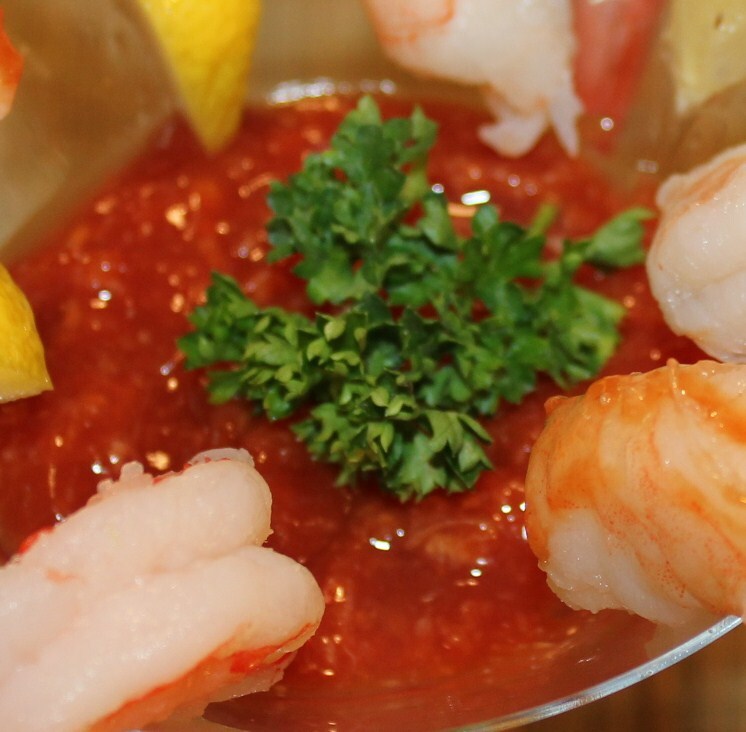 Thaw the shrimp in the refrigerator, rinse, dry and add to a large mixing bowl. Sprinkle with the fresh lemon juice. Add the onion, celery, red bell pepper and cucumber and mix well. 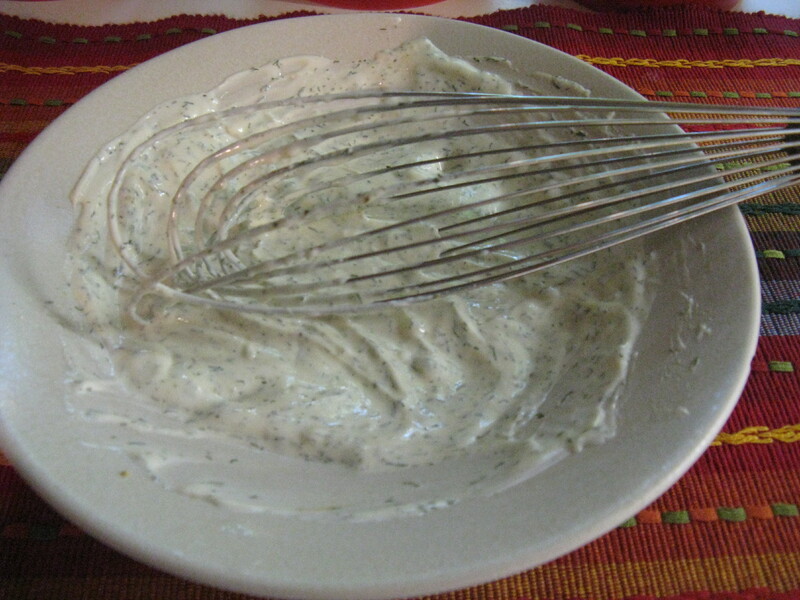 Make the dressing by whisking together the mayonnaise, white wine, mustard, dill weed, salt and pepper. 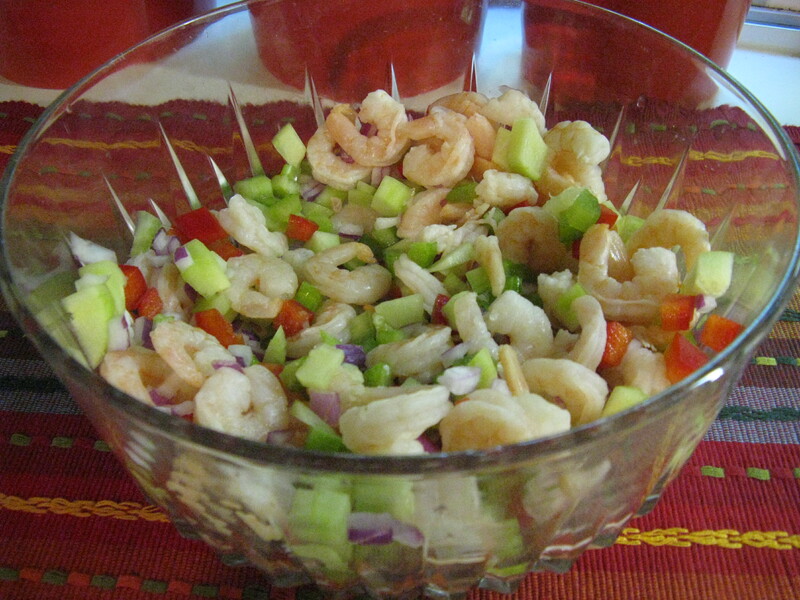 Add the dressing to the shrimp mixture in small batches – you don’t want to over-saturate the shrimp. Many times I have just a little bit of dressing left over. 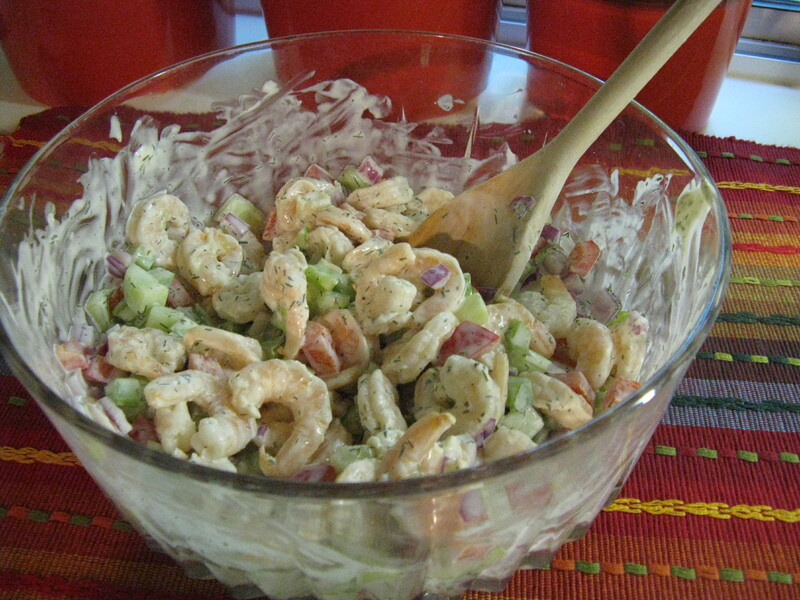 Refrigerate the shrimp salad for at least an hour so that the flavors meld together well. Cut the pita bread in half to make two pockets. Lightly toast. Fill with the shrimp salad. 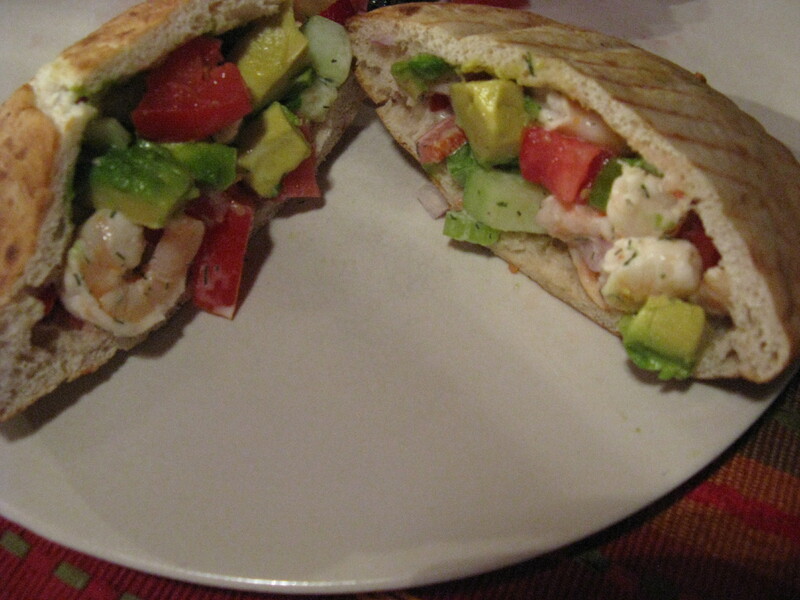 I especially love how the shrimp and avocado taste so good together. By the way, if you are watching your carbs and want to ditch the bread, just serve this salad on some lettuce or spring mix. 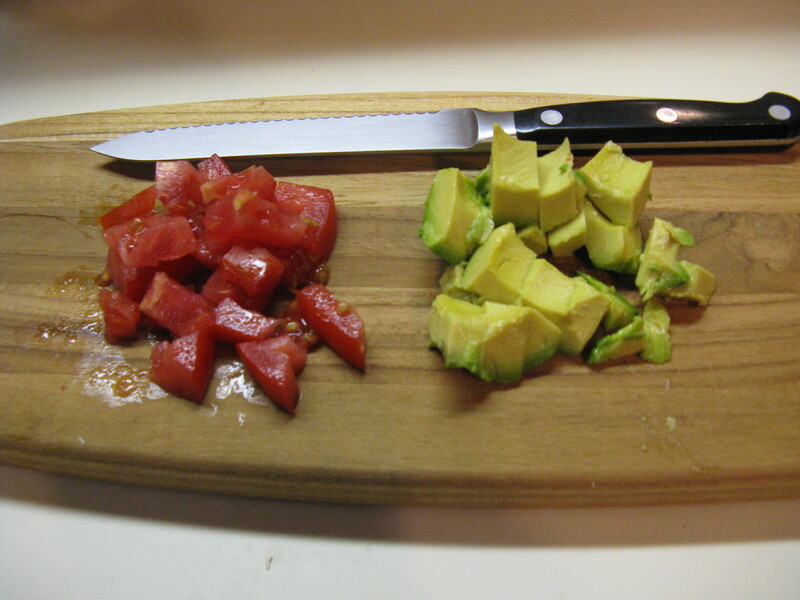 Pair this with some cut-up fruit and a glass of white wine for a light, refreshing and oooh, sooo good meal! Bon appétit, and eat, drink and be merry! This entry was posted in Low fat, Pescatarian, Recipes and tagged eat drink and be merry, food blog, Kel's cafe, kel's cafe of all things food, kel's cafe pescatarian recipes, kel's cafe recipes, Kelley Chisholm blog, pescatarian meals, pescatarian recipes, pita recipes, Recipes, shrimp salad pita recipes, Shrimp salad recipes, shrimp salad stuffed pitas on June 10, 2011 by kelscafe. Aaaaah, crabs. I love the sweetness of the meat, whether it’s Maryland blue, Dungeness, rock, Alaskan King or soft shell. I have to admit that sometimes I’m lazy and just buy the fresh crabmeat that comes in the plastic containers. I usually buy it only when it goes on sale –it’s just too expensive otherwise. 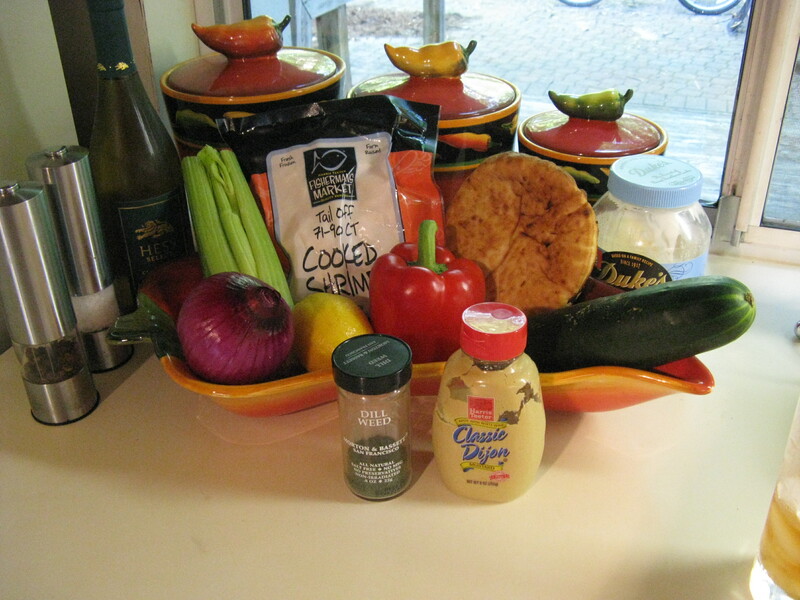 Then comes the hard decision – do I just sauté it in butter, or do I make crab cakes? Either way is fine with me because both are a treat! 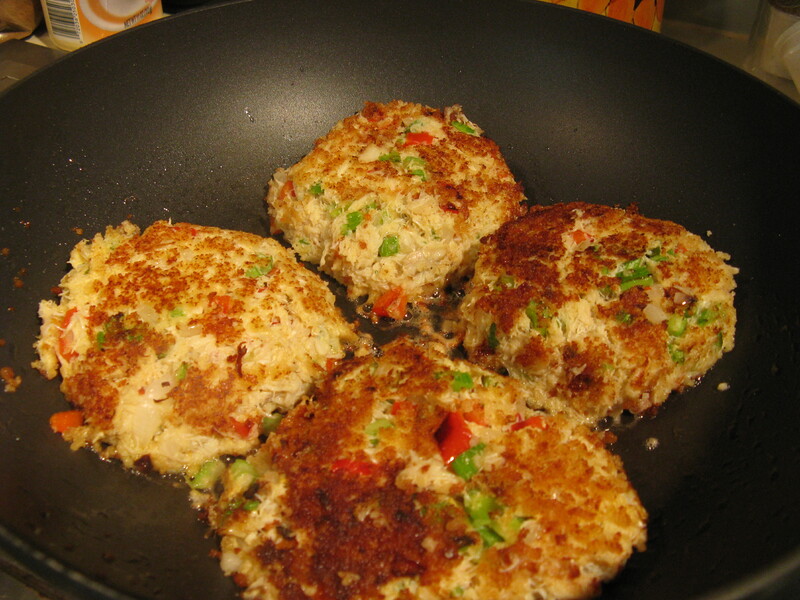 I recently bought Casey’s backfin/blended lump crab to make cakes. I do not like using a lot of filler in the mix, and this recipe is so easy, and oh, so tasty! 16 oz. fresh crabmeat, picked over with any shells, etc. 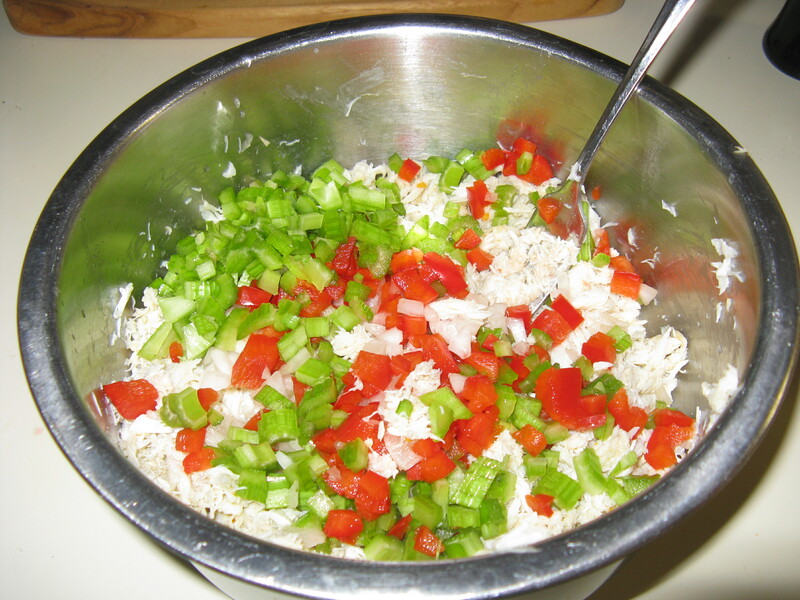 In a large mixing bowl, flake the crab meat with a fork, and sprinkle it with the fresh lemon juice. Add the red pepper, celery and onion. Mix together. 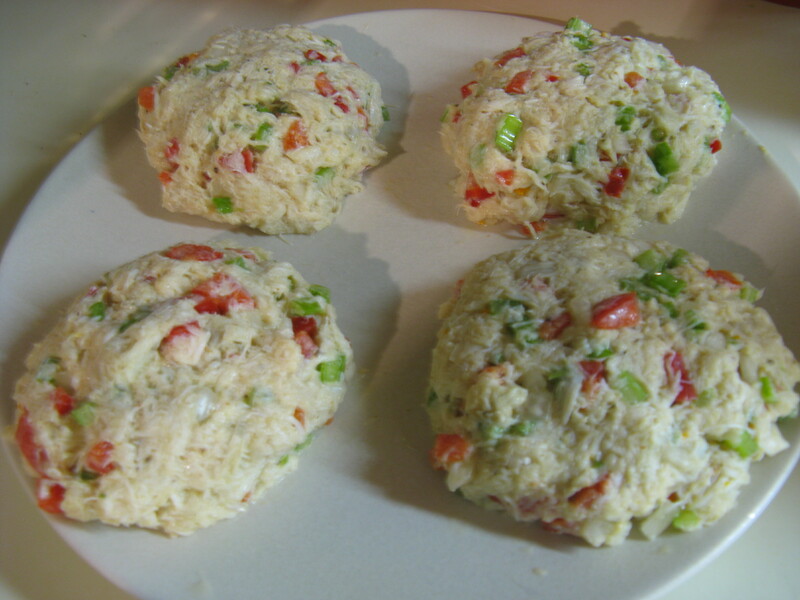 Add the egg and mayo to the crab mixture, and blend thoroughly. Season the mixture with the garlic salt, pepper, hot sauce and Old Bay– start slowly because you can always add more. I usually add at least a teaspoon of each and then go from there. 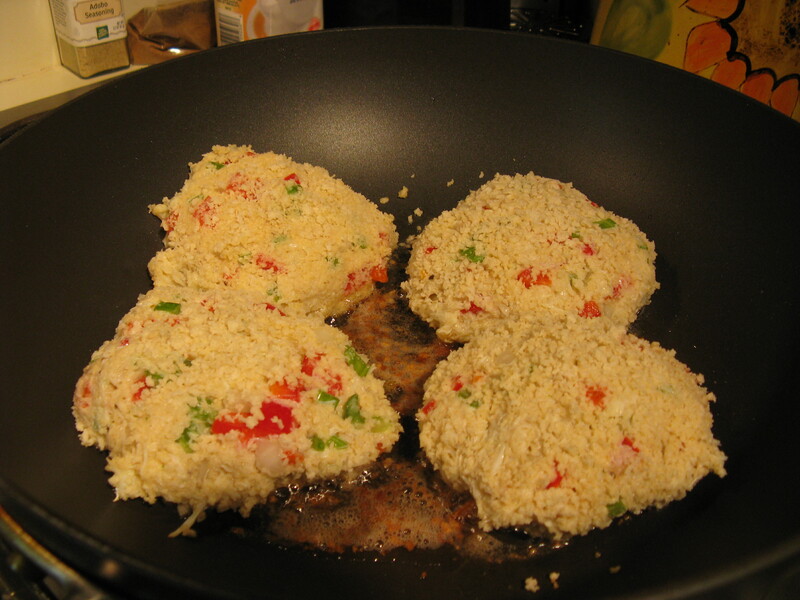 Form into 4 large patties, or 8 smaller ones. Refrigerate for at least an hour. This step is so important because it makes the cakes hold together better, especially since I leave out filler such as breadcrumbs, crackers, etc. in the mix. Sauté over medium heat for 3-5 minutes per side, until golden brown. Take care when you flip them over so they don’t break apart. These are great without any sauce, but feel free to serve them with your favorite cocktail sauce or fresh lemon. 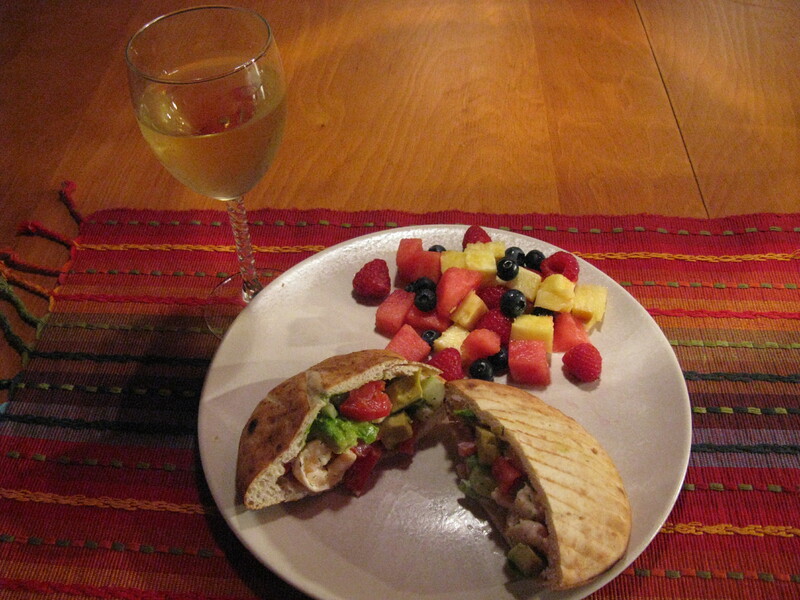 My favorite pairings include a tossed mixed green salad and a glass of Sauvignon Blanc or other white wine. 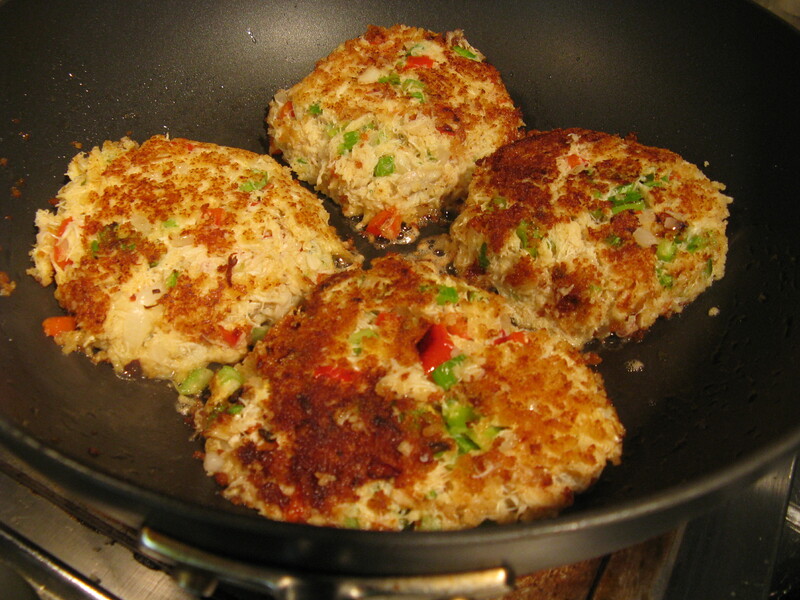 This entry was posted in Pescatarian, Recipes and tagged Crab Cake recipes, crab recipes, crabcake recipes, crabilicious, eat drink and be merry, food blog, Kel's cafe, kel's cafe pescatarian recipes, Kelley Chisholm blog, pescatarian recipes, Raleigh food blog on May 29, 2011 by kelscafe.